That's When Your Heartaches Begin Larger image below. Please Note: This item is available to U.
Mint - Perhaps the most famous recording event in all of music's history. In 1953, the exact date is unknown, when Elvis Presley made his historic decision to enter the Memphis Recording Service on Union Ave. To record My Happiness backed with That's When Your Heartaches Begin, he unknowingly began the greatest recording career of all time. These two songs would remain unreleased for almost 40 years when RCA would finally issue them on the Complete 50's Masters boxset. Incredibly this version of That's When Your Heartaches Begin is an alternate to the released version and has never been heard to this day. The beautiful white & red label features Memphis Recording Service 706 Union - 37-7197-Memphis, Tenn. Typed on two lines That's When Your Heartaches Begin Elvis Pressley (misspelled). Elvis' name is underlined in pen. On the second line it says For radio station play only, under that written in ink Humes the name of Elvis' high school. This acetate, from the personal collection of Elvis Presley, is without a doubt the rarest record in the world! This is written in stone!!! Paul Lichter's Elvis Unique Record Club was founded in 1970 and has been supplying Elvis fans worldwide for four decades. Paul has written 30 books about his friend Elvis and has often been called the world's leading Elvis authority. Whether you are looking for Elvis' first Sun recording, an authentic autograph or a photo of Elvis performing at a concert in your hometown, chances are you will find it as part of our large inventory of mint Elvis original treasures. This is written in stone!! Once you leave feedback for us we will respond by leaving feedback for you within 24 hours. We care and will always take that extra measure to satisfy you. Elvis Unique Record Club 10933 East Elmwood Street Mesa, AZ 85207. 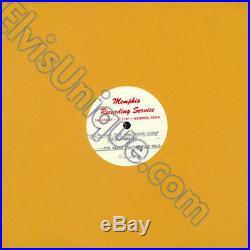 The item "Elvis Presley That's When Your Heartaches Begin Unreleased Sun Acetate" is in sale since Thursday, December 01, 2016. This item is in the category "Music\Records".com" and is located in Mesa, Arizona.